One of the many decisions a bride-to-be needs to make is what to give to her maid of honor and her bridesmaids as thank you gifts for being part of her big day. My own wedding was a small private ceremony, so I only had a maid of honor. It was much easier to choose a gift for just one person rather than having to find one gift that will please several. My philosophy on gift-giving is . . . when in doubt, personalize it! You almost can never go wrong with a personalized gift. Whether you want to give a gift card, a piece of jewelry, or a huge gift basket, it would make a wonderful presentation if you put the gift inside a monogrammed bag. I found a huge assortment of personalized bags and totes on American Bridal. Here are some ideas to get you started . . .
Give a department store gift card inside a monogrammed toiletries or makeup bag so that she can raid her favorite cosmetic counters before the wedding. 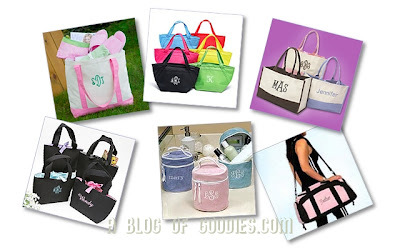 Fill a monogrammed lunch bag or cooler with bottled water and gourmet treats so that she will have something to nibble on throughout the day of the wedding between having her hair done, getting dressed, traveling to the ceremony, etc . . . If you are having a destination wedding, fill a personalized weekender, overnight bag, or carry on with snacks, a puzzle book, magazines, and other things to fill her down time. If you are having a beach wedding, fill a large monogrammed boat tote with flip flops, sunglasses, sunscreen, bottled water, and a beach towel. What kinds of fun and creative things would you put in a goodie bag for your wedding party?